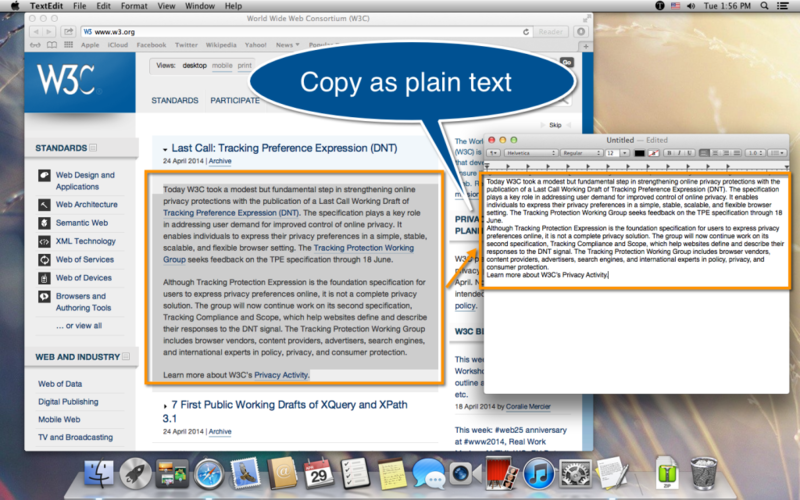 Copy as Text allows you to copy plain text from rich format content such as web archive, HTML, and RTF, without having to clear the format manually. With Copy as Text running in the background, rich format content in the clipboard is converted to plain text automatically so you don’t have to clear the format manually. Copy as Text also provides a “Copy as Text” service, so you can disable the auto check and copy the selected rich format content as plain text manually. To speed up your operation, you can assign a keyboard shortcut to the “Copy as Text” service in “System Preferences > Keyboard > Keyboard Shortcuts > Services”. If you are writing articles, papers or other materials and would like to have precise control over the text format, Copy as Text is for you!